Peanut butter offers a range of nutrients, including fiber and healthy fats. But many alternatives exist, some of which provide more heart-protective qualities or serve as options for people with peanut allergies. Healthy alternatives to peanut butter include different nut butters as well as seed-based butters. Peanut butter offers fiber, vitamins, minerals and heart-healthy unsaturated fats, along with potassium, which can protect the heart and counter the bad effects of a sodium-rich diet. Dr. Walter Willett, professor of nutrition at the Harvard School of Public Health, notes that while high levels of saturated fat may lead to clogged arteries, the relatively small amount in peanut butter is OK and that diets rich in nuts can reduce the risk of heart disease and Type 2 diabetes. The U.S. Food and Drug Administration lists peanuts as one of the top eight allergy-producing foods. As a result, people with allergies or nut sensitivities may want to avoid not only peanut butter but other nut butters. These include products from tree nuts like almond, walnut and pecan butters. 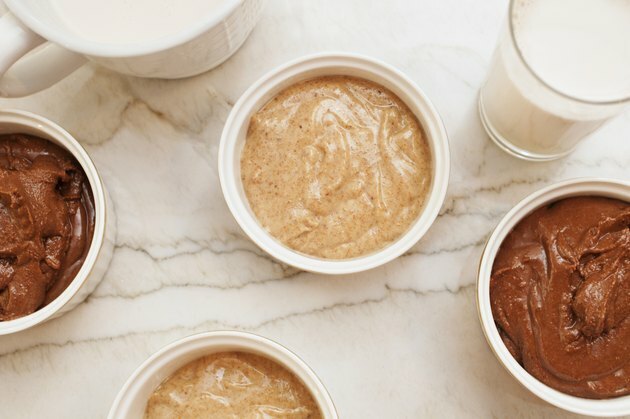 If nut allergies are a reason to look for a peanut butter alternative, seed-based butters like sunflower, pumpkin or sesame seed butters can offer healthier choices. All nuts contain fat, but much of it is heart-healthy monounsatured and polyunsatured fats. Almond butter has respectable levels of these good fats, with 8.9 grams of total fat and 7.4 grams of monounsatured and polyunsatured fats per tablespoon. Cashew butter is a close second, with 7.9 grams of total fat and 6 grams of unsaturated fats. Sunflower butter, meanwhile, contains 8.8 total grams of fat and 7.8 grams of unsaturated fats per tablespoon. These numbers are in comparison to peanut butter, which has 8 grams of fat and 5.9 grams of unsaturated fats. Walnut butter may be one of the healthiest alternatives to peanut butter. It's rich in omega-3 fatty acids; further, a 2006 study published in the "Journal of the American College of Cardiology" says walnuts can improve blood vessel, heart and lymphatic function. Subjects with high cholesterol consumed high-fat meals enriched with either olive oil or walnuts, and artery function in the limbs improved for those who had consumed walnuts. No such findings have been discovered for peanut butter.